Mitchell Towner "doesn't play poker" but that didn't stop him from winning the Monster Stack. Arizona professor Mitchell Town won $1.1 million and a bracelet after taking down the Monster Stack. Countless poker players spend their lives dreaming of a million-dollar score, chasing it hour after hour, session after session, tournament after tournament, year after year. Mitchell Towner is not such a player. He “plays a little cash for fun” when he finds himself in Las Vegas. Otherwise? “I really don't play poker,” he said. Nonetheless, he managed to do what so many dream of but very few have ever accomplished: book a seven-figure score on the felt. He defeated a field of 6,927 to win the $1,500 Monster Stack at the World Series of Poker for $1,120,196. Towner had zero recorded cashes before the win, and doesn't even have a regular home game that he plays in. He had only played in one tournament in his life that was for “more than $100” – a $1,000 or $1,500 event at the WSOP that he estimated was three years ago. Towner's life is centered around his work as an assistant professor of finance at the University of Arizona. It's a career he started only a year ago, having recently gotten his PhD from the University of Texas. He teaches two sections of junior and senior-level investment classes as well as some Master's courses for those pursuing MBAs. Now, this business professor has turned $1,500 into more than $1.1 million, the investment of a lifetime. And it comes in an era when many decry the game as too difficult to beat, with the word “solved” even thrown around when it comes to the highest levels. So how does a guy like Towner win a tournament like this? Although filled with scores of other recreational players, the Monster Stack certainly draws plenty of experienced sharks as well, as evidenced by a final table that included David “The Dragon” Pham (fifth), Andrew Moreno (sixth), and Matt Affleck (10th). Old-time legends TJ Cloutier and Donnacha O'Dea also made deep runs, as did Michael Rocco, Josh Arieh, Jared Jaffee, Andy Bloch, and David Peters. Ask Towner, and he'll tell you all he does is spend about an hour a week casually consuming poker media, giving a particular shoutout to “The Poker Guys” podcast. 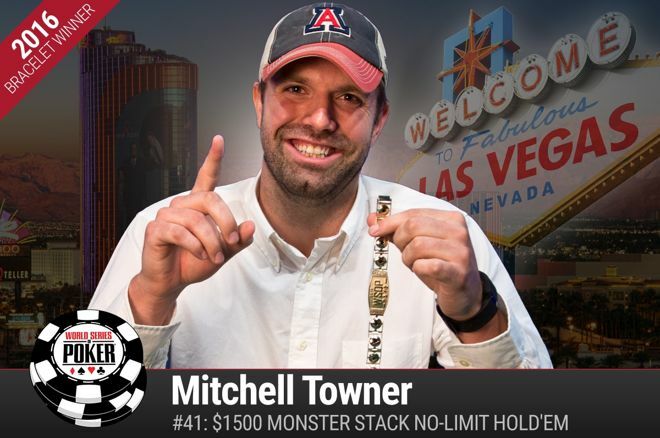 Armed with only the knowledge he gained from those sources, Towner headed to Las Vegas for a conference and decided to take a shot in the Monster Stack. He figured why not since he finally had “an extra $1,500” thanks to having gainful employment after years of having little to no money as a doctorate student. Somehow, Towner navigated his way to the final table. There, he plopped down in Seat 10 and looked to his left to see, in order, Daniel DiPasquale, Affleck, and Moreno, the latter pair being two of the most experienced players and dangerous players left. That mindset, combined with a little good fortune such as when his tens held for his tournament life against the ace-king of Cody Pack at the beginning of the final table, was enough to push the professor into the winner's circle. And a professor is what he will remain, monstrous score aside. He did admit he would love to play the WSOP Main Event but wasn't sure if it would work with so much already planned for the summer. Regardless if anything changes for the rest of his summer, the 29-year-old does see at least one benefit to his big win that should carry over into the school year. Be sure to stay tuned to PokerNews.com for continued coverage of the 2016 WSOP, brought to you by our sponsors, 888poker.